425V63- Just like George Harrison's "Ready, Steady, Go" guitar. 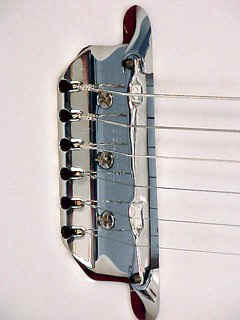 1 Pickup, no vibrato despite the "5" designation. Jetglo and Burgundglo only. The story of George Harrison´s 425. Where was the 425 Purchased? Mr. Gabe McCarty, formerly of the Illinois music group the "Four Vests" provided invaluable information regarding George Harrison's purchase of his first Rickenbacker, a 425 Model. Mr. McCarty experienced what most would consider to be a dream of a lifetime. He spent two weeks with George and his bother Peter in the fall of 1963. This visit took place at a time when virtually nobody in the Mt. Vernon area knew who anything about George Harrison . The selection and pruchase took place at the Fenton Music Store located at 601 South 10th Street, Mt. Vernon, Illinois. Lester "Red" Fenton operated this music store in 1963 at the time of the sale and continued to be its proprietor until the mid 1980's. Mr. Fenton died in 1991. What Were The Details Surrounding The Purchase? Shortly after arriving in Illinois, George Harrison met Gabe McCarty and another member of the "Four Vests," Vernon Mandrell. George expressed his interest in purchasing a Rickenbacker guitar and Gabe knew that the only dealer nearby was the Fenton Music Store. Apparently Rickenbackers were difficult to come by in England at this time and in Gabe's words "He just had to have one." Mr. McCarty volunteered to drive Harrison from Benton to the store in Mount Vernon to try out a Rickenbacker. Gabe recalled his pitch "Red, he's a good friend of mine and wants to buy a Rickenbacker guitar. Give him the same discount you gave me." The Four Vests had fostered a good relationship with Red Fenton as they had purchased equipment from him only a short time earlier. 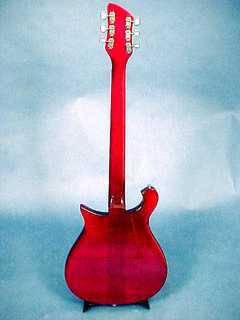 In his reminiscence of the events that day, Gabe mentioned "George pulled a couple of guitars off the wall" and eventually decided on a Fireglo (red) Rickenbacker Model 425. 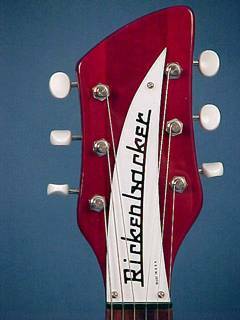 This description is validated by the research carried out by Mr. John Hall of Rickenbacker International Corporation which indicates that the guitar Harrison purchased, based on the serial number of BH 439, was shipped from the factory in the Fireglo finish. The serial number would indicate that the guitar was made in August 1962. 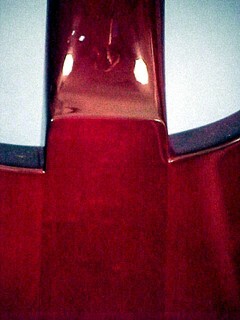 That it was "red" is of particular interest. It is well know that Harrison performed with this guitar on the "Ready Steady Go" television show hosted by Dusty Springfield on October 4, 1963, however, the instrument had been refinished to black by that time. But how did that refinishing come about? Just days after his return to England in September 1963 Harrison performed with his new 425 on the "Ready Steady Go" television show hosted by Dusty Springfield on October 4, 1963. 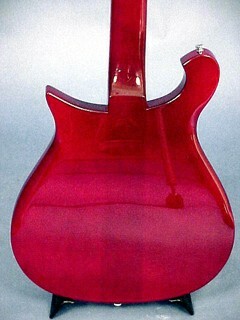 The guitar was, however, no longer in its pristine factory Fireglo finish but had been refinished to black. He briefly discussed his new purchase and in an interesting comment made to Dusty about its finish quipped "I made it myself." This of course, raised the suspicion of some that he had been involved in the refinishing. Fortunately the comments of the Four Vests have been most helpful in getting to the bottom of such speculation. 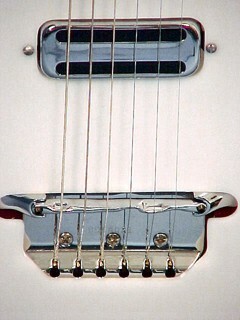 Gabe McCarty vividly recalled that Harrison liked the 425 very much but preferred to have it in black similar to the one owned by John Lennon. He remembers George asking "Don't you have any black ones." Red Fenton, asked Harrison to "give me a week" but that he would be able to comply with his request. Gabe described that he, Harrison and Vernon Mandrell returned to Fenton Music a week later to pick up the guitar. Why and Where was the 425 Refinished? 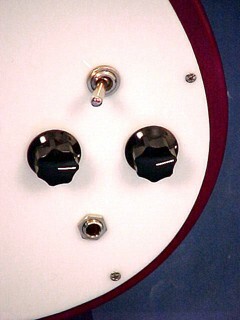 Gabe McCarty could not understand why George wanted to paint over the especially nice famous fireglo finish that was highly sought after by Rickenbacker lovers. In reference to the Beatles, George explained that "all the other guys had black instruments" and that the color fit in best with the band. Gabe also felt that the gist of the argument was that a black guitar fitted in best with the dark suits that the Beatles wore on stage. Mr. McCarty assessed that the refinishing was carried out in the Fenton Music store as Red Fenton had the expertise and there were no other shops about that Gabe was aware of that could do this work at the time. In referring to Red, Mr. McCarty offered "I thought he did it himself. It looked real good and I was quite surprised." George Harrison paid in cash, about $400 US, for the guitar. He apparently had no idea of the value of American dollars compared to the pound sterling and at first took out close to $800. to pay for the 425. 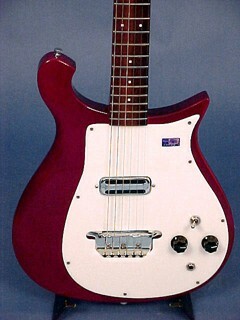 There were a number of other interesting events that took place during the Harrison's visit to Southern Illinois that are related to George's Model 425 Rickenbacker. The day in which George returned to purchase his newly refinished guitar, Gabe recalled "he plugged it into an amp and we jammed for about 30-40 minutes in Fenton's Music Store." Red did not know the more contemporatry rock music songs and so George on his 425 and Gabe on a bass from the store played more traditional "pop songs such as It Had To Be You." Mr. McCarty also indicated that George played two gigs with the "Four Vests" during September 1963 at the Veterans of Foreign Wars (VFW) Hall in Eldorado, Illinois and also at the Bocchi Ball Club in Benton. Gabe was sure that George was going to play some of his Beatle's material but this never happened with Harrison performing mostly Hank William's country tunes at both venues. George also played with the lead guitarist of the "Four Vests," Kenny Welch and Gabe in his sister Louise's livingroom in Benton at 113 McCann Street. Gabe said that George was very taken by Kenny's ability and watched him intently but never really said muc about Mr. Welch's ability.. He said that Harrison's style was much like the picking style of Chet Atkins. In 1997, or thereabouts, this house was moved to a new location in Benton. Its exterior was refurbished to resemble its 1963 look and the residence is currently a Bed and Breakfast and museum honouring George Harrison's stay. George's visit to Illinois spanned the period from September 15th to October 3, 1963. After arriving in England he got the opportunity to use his new Rickenbacker 425 at "Ready Steady Go" and some Beatle historians have commented that it was not used subsequently. 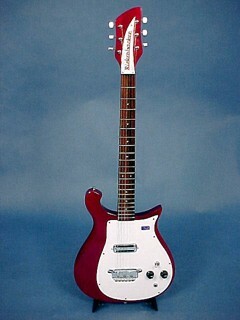 Althought it is fail to comment that Harrison did not use his new Rickenbacker extensively, he did use it on several occasions throughout the Beatle's Swedish Tour over the period October 25 to 29, 1963. The tour was a brief one with the Beatles performing to enthusiastic Swedish fans on the following schedule: October 25th - Nya Aulan,Karlstad; October 26th - Kungliga Hallen, Stockholm; October 27th - Cirkus, Goteborg; October 28th - Borashallen, Boras; and October 29th - Sporthallen, Eskilstuna. 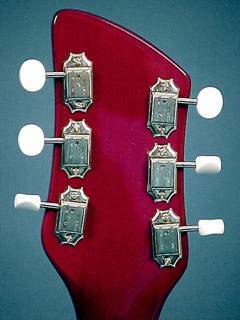 Shortly after the Swedish Tour George again used his 425 on November 2, 1963 at the City Hall concert in Sheffield, England.